Lost socks, stickers and coffee cups are among the thousands of items picked up by dedicated Merton Council staff despite the downpours in the first week of the Wimbledon tennis Championships. Merton Council staff from left, Mark Arnold, John Foster and Eric Kerbey in Wimbledon Park. Staff with years of experience under their belts have been out in Wimbledon Park this week in all weathers making sure everything is running smoothly for the thousands of tennis fans who camp out in the hope of getting tickets to see Andy Murray on Centre Court. David Byles, Parks Support Manager in the Environment and Regeneration team, has been working for the council for 48 years. David and his team play a vital role in keeping things moving, whether that’s directing cars, checking and issuing passes, dealing with thousands of questions from tennis fans or litter picking and changing the rubbish bags attached to barriers. He said: “We arrive at 6am and there are usually four or five cars there waiting to get in. He said a team of six people supported by up to 15 agency staff keep on top of the litter picking. VIDEO: Staff including Mark Arnold, John Foster and Eric Kerbey are working in Wimbledon Park throughout the Championships. Teams are there for more than 12 hours a day on a rota basis before packing up for the day and starting all over again the next morning. They also help with managing the famous queue which can swell to 6,000 people every day during the first week. Last year, the team directed 4,117 cars, 33 minibuses and 46 motorbikes, as well as coaches. Litter picker Keenal Majithia, 20, above, said: “The crowd have been really nice. “I found a couple of socks. I don’t know how people managed to lose them. Mike Youens, who has been a steward there since 1985, said: “The co-operation between David and his men is really fantastic. Tennis fans Stephanie Rowe and Mel Tan, originally from New Zealand but living in Clapham Junction and Tooting, said they were very impressed by what they saw. 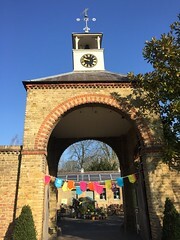 It was their first time joining the queue in Wimbledon Park for tickets, and they said it was very well organised, and that staff were chatty and friendly. “It is a long wait, but we don’t mind waiting when it is this well organised. “The litter pickers have been coming round. They are great, they have smiles on their faces,” Stephanie said. Paolo Franca, 55, left, and friend Alberto Bombana, 56. 55-year-old Paolo Franca joined the queue for the Championships as part of a short holiday from his home in Verona, Italy. He said: “It is really nice, really well organised. We were very impressed with the organisation. PCs from Merton and Sutton were there to keep people safe. From left: PC Tom Edmonds, PC Jo Reeve and PC Connor Ashwin.